← Is a year enough time to plan? Because we had so much fun making Stroopwafels, my sister and I started immediately working on what we wanted to bake next. She was in the mood to do something with yeast dough, so a flurry of possible recipes flew back and forth. 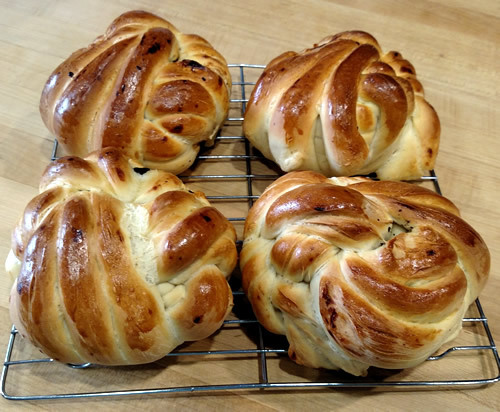 Since I picked the recipe the last time, I told her she had to pick it this time, so finally she decided on these, which are yeasted buns filled with cinnamon and chocolate, and plaited into a complicated shape. 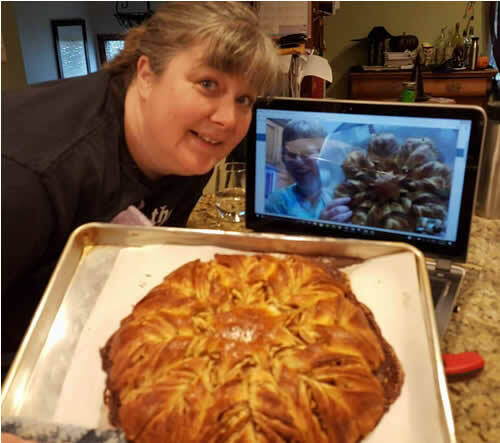 Due to the fact that it’s a yeast dough, we decided we’d both make the dough and set it aside for its first proof, and then join up via Google Hangouts for the next half of the process. 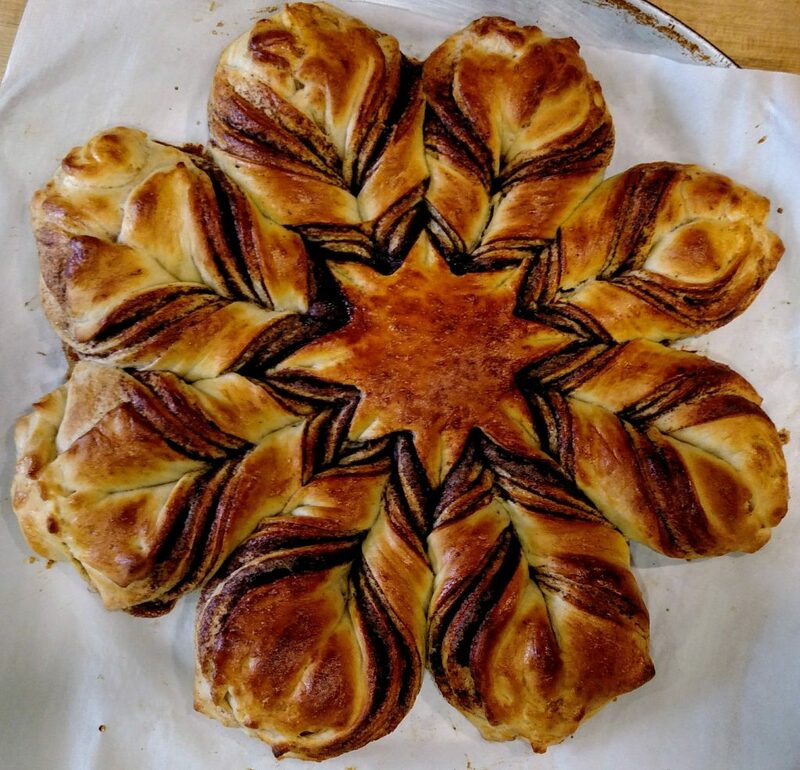 Looking at the recipe, I noted that we were going to be otherwise twiddling our thumbs for an hour during the second rise, which is why we then also decided to make the Cinnamon Star from King Arthur Flour. 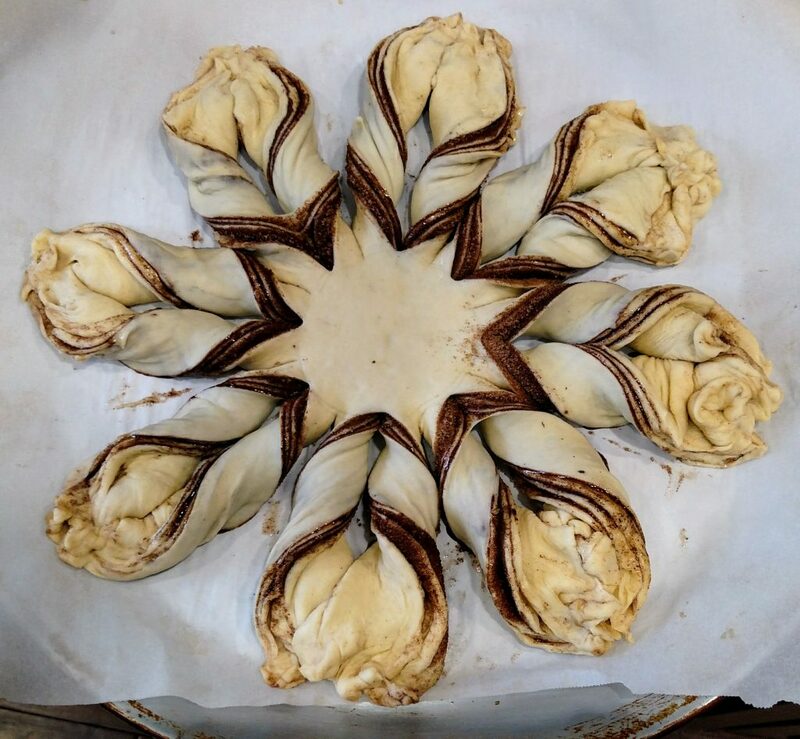 Conveniently enough, that happens to be the current monthly bake-along from King Arthur Flour (although I hadn’t realized it at the time I suggested it), so that link actually includes lots of details and pictures of the entire process, if anyone else wants to play along. I made both doughs last night and popped them into the fridge, but the dough for the buns didn’t work out, so this morning I hastily remade it…which is why we ended up swapping the order for what we made, since my dough needed extra time to rise. Anyway. First up – the cinnamon star. My sister’s made that one before, and she happens to have a lot of apples so she decided to add some chopped apples to her cinnamon mixture, whereas I stuck exactly to the recipe. Here is my star, prior to baking. It looks way more impressive than it has any right to be (trust me when I say this was a hot mess prior to the cutting and the twisting step). So once we had the stars formed and resting under towels, next we tackled the buns. These were…a pain. The instructions are text only, so both of us were reading them aloud, trying to figure out what, exactly, we were supposed to be doing with the plaiting and the stuffing. 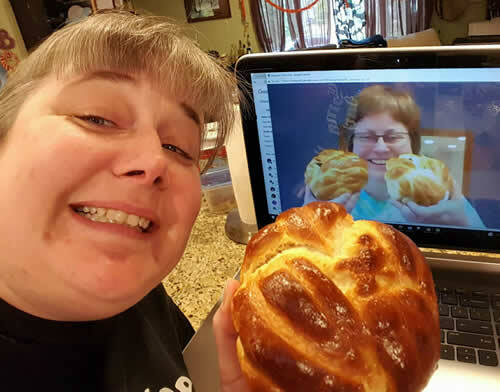 At one point I was holding up the laptop, so that the camera was facing down at my worktop, trying to plait the dough one-handed (not very successfully) so she could see what I was doing. Suffice it to say, neither of us has a clue whether we did it correctly or not. 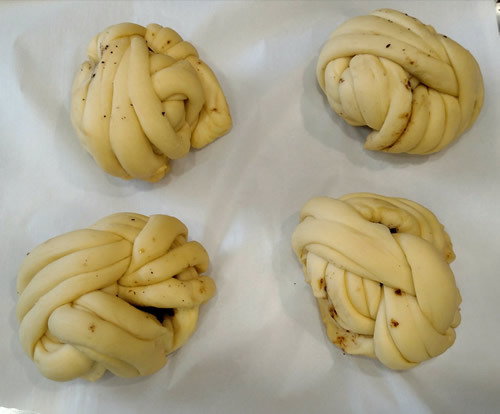 But we got them all plaited and stuffed, in one form or another. Here they are, rising. So once *that* was done, and all the snickering and inevitable comments about ‘playing with our buns’ were out of our system (I kid, those will *never* be out of our system! ), it was time to bake the stars. Here is my cinnamon star, after baking. It smells as delightful as it looks, and tastes even better! Here are my sister and I, with our respective stars. Hers spread out a bit more due to the apples (and took a lot longer to bake because the apples made the dough a lot wetter). Verdict from both sides of the Google Hangout – yum! And then about 20 minutes after those came out of the oven, it was time to pop in the buns. Which then proceeded to grow to ginormous size in the oven. Think I’m kidding about the size? Here we are, both of us posing with buns almost as big as our faces. One of us may or may not have quoted modified lyrics to Baby’s Got Back at this point. Mayyyybe. Naturally we allowed these to cool completely before we, oh who am I kidding, you all know darn well we cut one of those suckers open and tried it immediately. The dough itself is quite lovely – it’s a nice light texture and has some good flavor. The filling was…eh. I suspect next time I need to try to get a lot more of the sugar mixture into there (or else don’t use as dark a chocolate as I did). Verdict – tasty, and fun to try, not something either of us will likely do again. So overall, the second #BakingSisters day was a success. This entry was posted in Baking, Baking Sisters, Kitchen Adventures. Bookmark the permalink.